What happened to Malaysian flight 370? Re: What happened to Malaysian flight 370? There is something very big happening here only the top people know about. According to the Malaysian PM's media brief, they suspect flight communication system deliberately disabled & now they focused their eye towards crew & passengers. Already they begun to search pilot's resident also. As we discussed some thing behind the scene. Bloody thing will reveal very soon. Feel sorry for the innocent passengers. 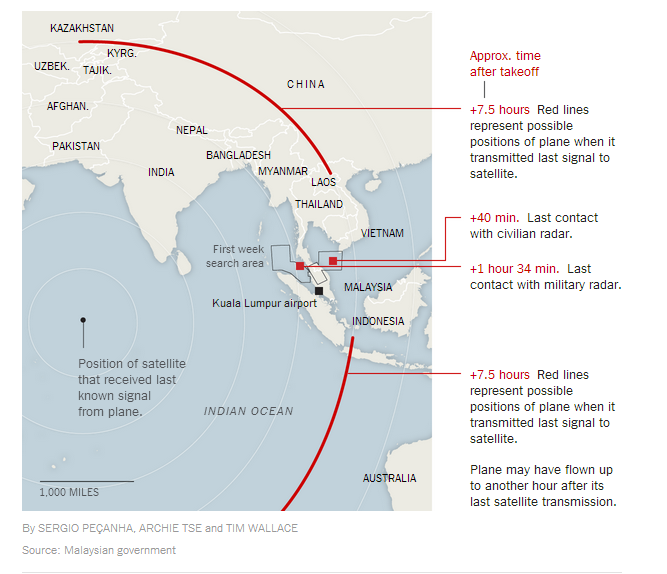 "Malaysian PM, Najib Razak, today did his dramatic press conference, during which he told reporters new satellite data indicated that MH370 last made contact roughly seven hours after it vanished from civilian radar one week ago." This means we have to edit our map and extend possible location further away from the circle we draw. The cruising speed of B777-200ER is 900kmph. 900km/h x 7hrs = 6300 km. ER means Extended Range . This aircraft is designed to go more distance than normal B777. It's max range is about 11,000 km with over 300 passengers and MH370 was not fully loaded. If it was flying for 7 more hrs that means the plane -and the passengers- could be safely in a place like Madagascar, Somalia, Yemen , Kazakhstan or Iran at the moment. ok but there are questions? what's the intention of this? If it's that there should be some group claiming the crime and demanding .but there is none. how it's flown and landed without noticing by any RADAR or so developed technological other barriers (all the countries mentioned above are surrounded by many US bases. Rainmaker, welcome to the forum mate. Thank you for the link and welcome to the forum. I calculated it based on 7 hr given by Malaysian PM. They say they got a signal after 7 hrs. Its last successful trip from KL to Beijing took 5 hrs 32 mins. They say it can travel 7 hrs max with spare fuel. MH370 left KL at 12.43 (0043) midnight. Last radar position 01.20 am before shut down of comms. Last ping from aircraft received by satellite at 08.11 am i.e. 7.5 hrs after the departure ! If news lines are correct, now it is established that last sat ping was sent from aircraft at 8.11 am. If so, the plane was intact after 7.5 hrs of flying. If its max range was 6-7 hrs that means the plane should be on ground at 8.11. The satellite ping was received for each hours. Last ping was 8.11 am means 9.11 am ping wasn't recorded. So u add up another possible maximum of 1 hr and take 1.5 off which already spotted in the military radar. So maximum 7 flying hrs seems ideal radius for search. So 9.11 am ping was not transmitted since the flight could have either crashed or the battery run out of charge- in case plan landed safely. 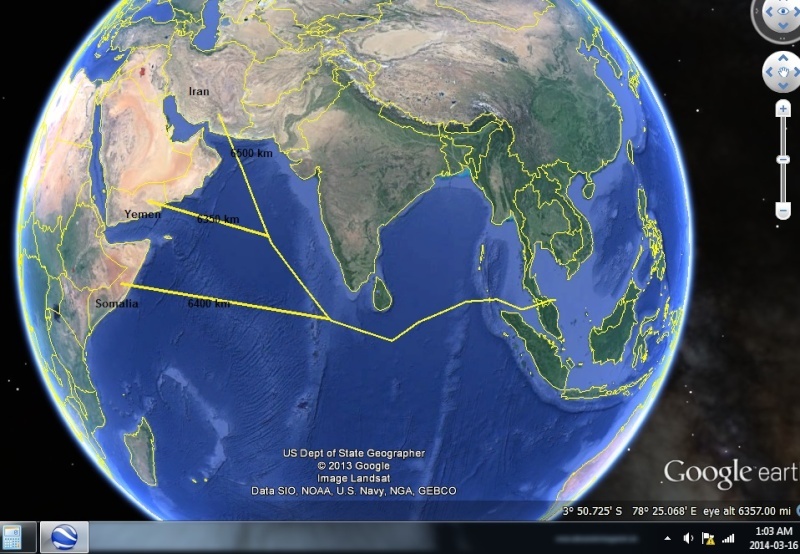 If pilot plan to crash in the water there is no necessary that is travelled to far end. It could have crashed nearby somewhere. Most likely the landing spot was targeted- could be unsucceeded too. The below news read as "The satellite "pings" that were last read at 8.11am on Saturday – six hours after Malaysian military radar last detected the aircraft over the Malacca strait at 2.15am – could still have been transmitting data from the ground, if the plane were to have landed, said Malaysia's civil aviation chief, Abdul Rahman." Apologies for my previous mis calculation of 4.5-5 hrs. In one of the paper article, the editor mentioned if blackbox recorder was manually switched off by pilot then there wouldn't be any possibility to find what had happened in the flight during its final moment. Is that possible? I thought that black box cannot be controlled by pilot. Pathetic situation still most ppl blindly follow them. wht abt predicting stock market. We should appoint one. Which article said that ? What was turned off was the communication systems and transponders. Black box should be active but useless until recovered. High time to rethink about Air plane real time tracking systems and the designing black boxes. Jana1 wrote: In one of the paper article, the editor mentioned if blackbox recorder was manually switched off by pilot then there wouldn't be any possibility to find what had happened in the flight during its final moment. Is that possible? I thought that black box cannot be controlled by pilot. Sri lankan government should deploy some naval ships & aircraft to join this search mission. Then the international community would consider that as a positive move. All these little things help to build the image.